Homemade Food Made Easy & Nutritious.Turn mealtime into a celebration! Wholesome Homemade takes the guesswork out of making a freshly prepared meal, so you spend less time chopping, dicing and cutting and more time with your dog. 3 Easy Steps - Just Add Water! At Only Natural Pet we believe passionately that a natural lifestyle contributes to a longer and healthier life for your pet. Everything we carry meets our rigorous standards and is guaranteed to be safe and effective for your pet. Our mission is to make healthy choices easy for you and your pet. We measure success by your pet's health, vitality, and quality of life. That's why we offer affordable shipping and no-questions-asked returns on every single product we carry. We want your pets to jump for joy every time the Only Natural Pet products arrives; if not, we'll take it back. Simply click ADD TO CART to order yours today! ONLY HIGH QUALITY INGREDIENTS - that are naturally high in protein for a species appropriate diet. Gently dehydrated to maintain maximum nutrients, including vitamins, minerals and antioxidants. Healthy source of low glycemic carbohydrates. OUR HONEST PROMISE - We only use thoughtful, responsible ingredients including high quality meat and protein. We test every batch for safety and quality. We source the highest quality ingredients with NO ingredients from China. We never use any artificial flavors, colors, preservatives, or fillers. MINIMALLY PROCESSED HOLISTIC FORMULA - Complete, balanced & minimally processed. NON-GMO fruits grains and vegetables. Bioavailable source of naturally occurring nutrients, like essential fatty acids and amino acids. POWERBOOST BLEND - is our proprietary coating of freeze dried, superfood ingredients formulated to offer an extra nutritional boost, including natural joint support, anti-inflammatory, stomach soother and digestion support. SATISFACTION GUARANTEE - Only Natural Pet products always include a 100% Satisfaction Guarantee. Only Natural Pet uses only the highest quality dehydrated ingredients in our products. Providing you & your furry friend the highest quality products is our top priority. If you have any questions about this product by Only Natural Pet, contact us by completing and submitting the form below. If you are looking for a specif part number, please include it with your message. 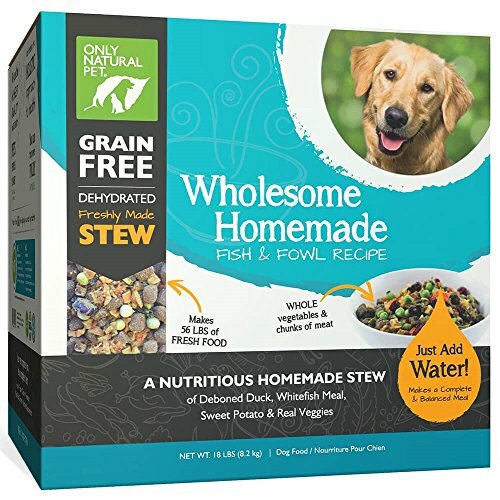 Honest Kitchen The Human Grade Grain Free Beef Dehydrated Dog Food, 2 lb Fast Delivery! !